The primary onboard computer while underway is a 24” iMac. 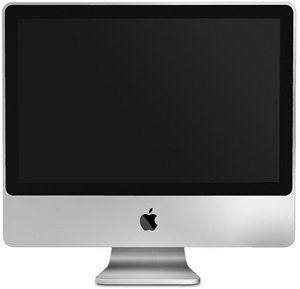 The iMac was selected because it’s an integrated unit with everything (monitor, cpu, disk, CD/DVD, networking) in one relatively thin package which was easy to mount at the nav station. However, since most of the navigation software is only available for Windows, it uses Bootcamp to run Windows XP. Additionally, Fay and I each have a MacBook Pro which we use for our personal applications like email, web browsing, photography, personal finances, and entertainment. The final major piece of computing hardware is a 30” Apple Cinema display. The big display can be connected to either the iMac or the MacBook Pro’s. This gives us the big picture when we want to sit around the table and review a route, chart or some photographs. But more frequently we use it as our primary entertainment monitor. Keyspan serial/USB adapters are used to bring the serial connections into the iMac. Below are the primary applications used on the IMac. 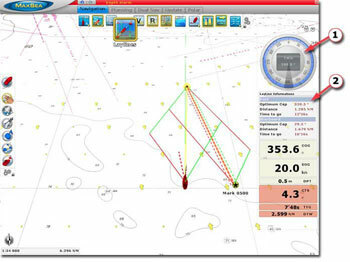 This is the primary navigation software and integrates tightly with the Furuno NavNet 3D equipment. I use it to plan routes, review weather while underway and act as a backup to the Furuno plotter. This is our primary email gateway while underway. We use XGate via the Iridium phone to access the Global Marine Networks email server for our boat email. Because it is very flexible, I also frequently use XGate on my MacBook Pro when we have a WiFi connection and use the GMN SMTP server for all our email accounts. XGate is very tolerant of weak connections and will push the mail through eventually when Mac Mail or Outlook would have timed out. These two applications are on virtually every cruising boat afloat. We use the ham version of Airmail, via the Iridium phone, to access our WinLink account as a backup email account when underway. I use ViewFax as the primary way to view and request weather faxes and GRIBs. If the Iridium connection fails, then AirMail is used to access email and weather via the SSB. This free software from Maretron is great for getting a closer look into the NMEA 2000 network and each of the NMEA 2000 devices.